The 550 Spyder put Porsche firmly on the map as a serious competitor on the world’s racing tracks; indeed, the diminutive mid-engined roadster generated the nickname ‘Giant Killer’ for its ability to defeat much more powerful rivals. Introduced at the 1953 Paris Auto Show, the Porsche 550 and its second iteration, the Porsche 550A, remained in production through February of 1959, and a total of 130 chassis were constructed before the Porsche 718 RSK Spyders appeared. A large proportion of 550 production was destined for the United States, where they were used extensively at different airport races. Built on a frame of seamless mild steel tubing, the Porsche 550 utilised a front suspension of double trailing arms and transverse-leaf torsion bars. After the first few examples, the rear suspension was redesigned from leading control arms to trailing arms with swing axles and tubular transverse torsion bars. Porsche’s engineers had planned an all-new engine to power the Porsche 550 Spyder at the gruelling Carrera Panamericana, but early testing determined that Dr Ernst Fuhrmann’s Type 547 advanced 1.5-litre air-cooled four-cylinder Boxer engine was not quite ready. Thus, the first few chassis were fitted with conventional pushrod Porsche engines. Soon, however, reliability was ensured and the new 4-Cam would be installed in all the 550s, 550As, RSKs, 356 Carreras, and Porsche 904s that were to follow. This marvellous but complex engine, called the ‘Drawer motor’ because its engineering drawings were quickly hidden in Fuhrmann’s desk whenever Dr Porsche walked into his office, was an all-alloy unit displacing 1,498 cubic centimetres. Its camshafts were driven off the Hirth-patent built-up roller-bearing crankshaft by a series of shafts and crown wheels. Cam timing took dozens of man-hours to properly establish, but once all the clearances were correctly set, the high-revving motor was very reliable. It featured dry-sump lubrication and two spark plugs per cylinder. With compression of 9.5:1 and breathing through a pair of Weber downdraft carburettors, this engine produced a strong 110 brake horsepower. In a chassis that weighed barely 590 kilograms, 550s were capable of top speeds approaching 210 km/h (140 mph), dependent on gearing. Because these little roadsters were ostensibly required to be street driven, they were fitted with a token canvas tonneau that met the letter of the rulebook but were otherwise better left folded away in the garage. 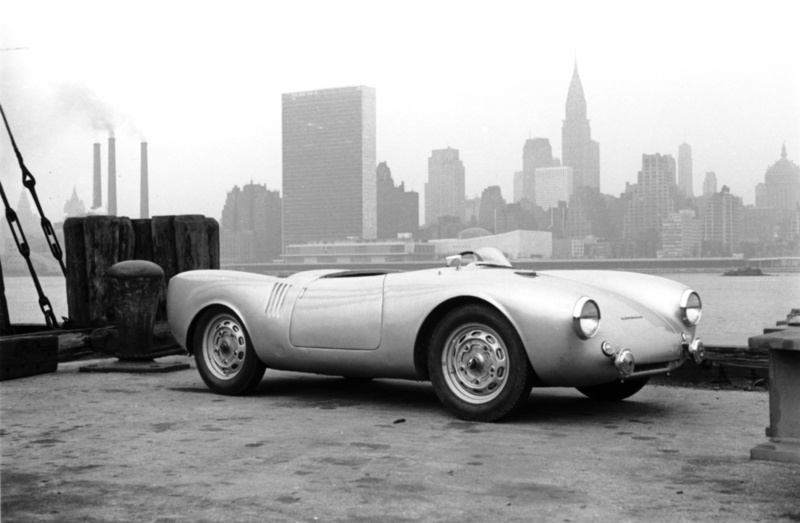 The Porsche 550 Spyder can be seen as Porsche’s first purpose built racing car. The first series of the Porsche 550 shared many components with the road cars of the marque. Despite the steel platform chassis that prevented the Porsche 550 Spyder to live up to its potential, it soon turned out to be a very succesful race car. When Porsche replaced the original steel chassis with a spaceframe chassis, , Umberto Maglioli even managed to beat far more powerful cars in the 1956 Targa Florio. The brand-new chassis made the car considerably lighter and even 5 times stiffer that its predecessor. Because of the stiffer chassis, the engineers replaced the suspension too, and the body could be lightened a lot.. The rear swing-axles were lowered substantially. The design of the Porsche 55oA is very much the same as the Porsche 550. However it can be easily distinguished by a louvered hatch on both sides behind the cockpit. During the development of the 550 most of the time and resources were spent on developing the Type 547 engine. The small four cylinder boxer with four tiny camshafts had performed really well, but Porsche engineers felt there was more left. A major development was moving the drive for the distributor from the intake camshafts to the crankshaft. Other improvements were fitting two Weber Carburetors and raising the compression. The Type 547/2 as the engine was known produced 125 bhp early in the year and towards the end of the season a reliable 135 bhp could be attained. Torque was also increased considerably from 120 Nm to 145 Nm. The engine was mated to a five speed gearbox and mounted midships in the spaceframe chassis. Still unpainted and virtually untested, the 550A was first raced during the 1956 Mille Miglia, understandably with little success. The German debut came during the 1000km race at the Nürburgring where two 550As were entered. They finished fourth and sixth overall, taking a one-two class win in the process. For the 24 Hours of Le Mans, two new cars were constructed, fitted with a fastback roof similar to the one fitted on the first 550s. One car retired, while the other finished fifth overall and first in class. After a successful debut season, Porsche commenced limited series production of the 550A for customers. In 1957 the factory continued development of the Type 547 engine and several versions with different displacements were constructed for use in hillclimbs. The largest was the Type 547/5 with a displaced of nearly 1.7 litre.